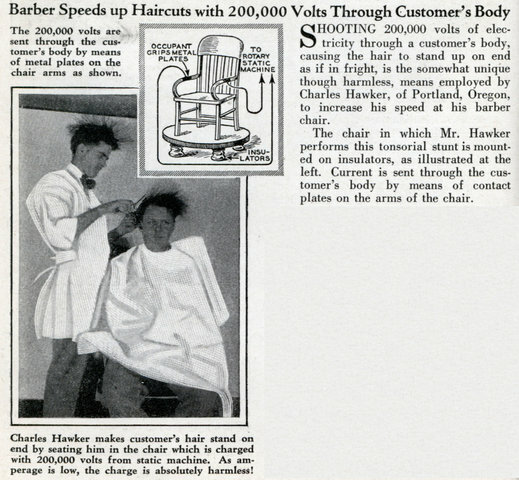 SHOOTING 200,000 volts of electricity through a customer’s body, causing the hair to stand up on end as if in fright, is the somewhat unique though harmless, means employed by Charles Hawker, of Portland, Oregon, to increase his speed at his barber chair. The chair in which Mr. Hawker performs this tonsorial stunt is mounted on insulators, as illustrated at the left. Current is sent through the customer’s body by means of contact plates on the arms of the chair. I am sorry, that man would never cut my hair. Too lazy to use a comb, he has to shock his customers.